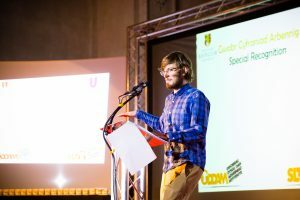 A lecturer from the School of School of Environment, Natural Resources & Geography received a special award from Bangor University students. On Friday 29th April, Dr Sophie Williams entered, to rapturous applause, a room packed with her students, colleagues, family and friends. On her first trip out of hospital for ten months she was at the University to receive an award for her incredible contribution to teaching. 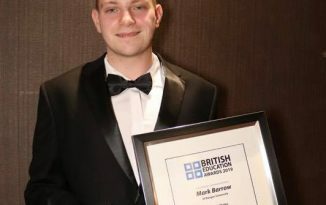 The Student Led Teaching Awards are a special honour for an academic as the nomination, selection and presentation of the awards are carried out by the students themselves. Sophie was nominated by undergraduates of the School of Environment, Natural Resources & Geography (SENRGy) for a “Student Voice Special Recognition” award. The event was opened by Professor John G Hughes, Vice-Chancellor. He recalled how impressed he was on his first encounter with Sophie during a ceremony to mark the start of the Two Dragons Garden project which twins Bangor University’s Treborth Botanic Garden with Xishuangbanna Tropical Botanic Garden in China. This was one of the many anecdotes of the afternoon emphasising Sophie’s strong communication skills – one of the many things which make her an exceptional teacher. 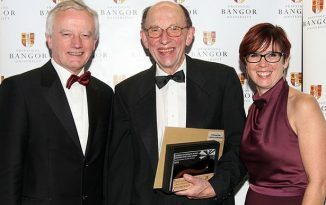 Professor Morag McDonald, Head of SENRGy gave a presentation covering Sophie’s contribution to Bangor and beyond. This included quotes from those who have worked with Sophie in the many training courses she has run in social research methods, conservation education and plant conservation from the University of Cambridge to Bangladesh via Mauritius and China. A presentation from two of her former students on the MSc Plant Conservation course which Sophie founded in 2014 followed. The recent graduates told how Sophie always pushed them to challenge themselves and try things which they find difficult and that this has had a truly life changing effect. One former student, now curator of Treborth Botanic Garden, sent a video of congratulations from Xishuangbanna Tropical Botanic Garden in China where she is currently meeting colleagues and continuing the link which Sophie started. The most important presentation of the event was of course the talk by three of Sophie’s current students. Despite being ill in hospital, Sophie has met with all three of these students to discuss their ongoing dissertation research. 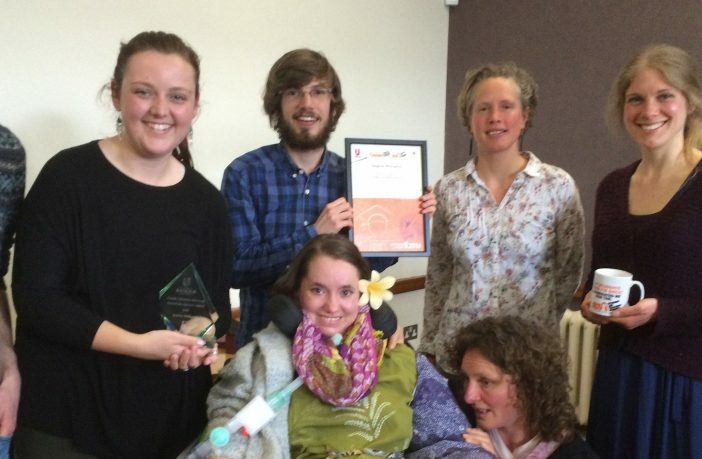 The award ceremony was attended by some of the medical team working towards Sophie’s rehabilitation.